Kirkcaldy were caught well short in the early kick-off game at Stoneyhill last Saturday. Behind 35-5 at half time against a Musselburgh team which oozed pace in every department, the Blues never totaly caved in, and with another three second half tries took a four try bonus from the game. Director of Rugby Mark Henderson was far from happy with the overall performance. “From the kick off there was a flatness about this showing,” he said. “Too often we seemed to stand back and let them do the business. At the first try we were little more than spectators and gave them the easiest of seven points. “Throughout the first half they were given too much possession which inevitably led to tries. “Things improved after half time with much better focus. Musselburgh were especially strong behind the scrum and made the best use of some ill-directed Kirkcaldy kicking. Lost possession became a growing problem for the visitors as the first half progressed and by the break the Midlothian side had touched down five and with the accurate boot of stand off Danny Owenson slotting all the conversions the issue was more or less decided by half time. 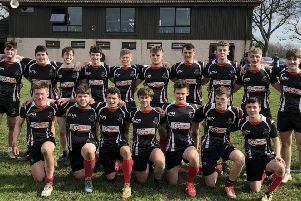 To their credit Kirkcaldy never threw in the towel and earned their single point with a courageous second half showing in which they matched Musselburgh’s additional three tries. While the Blues back division was more or less at full strength, the pack lacked two of the front row trio with only Marcus Salt starting and even he had to retire injured. Shortly after the powerful Rhys Bonner had a recurrence of a past knee injury. For the second week running Kirkcaldy conceded a try within two minutes even allowing for a Musselburgh error at the kick-off. Kirkcaldy lost control from the resulting scrummage and swift ball transfer gave Musselburgh a huge overlap. As the Kirkcaldy defence scrambled back Musselburgh was able to ignore that advantage and scrum half Kyle McGhie raced in for a solo try easily converted by Danny Lowenson. The Blues appeared to be settling down until a bad bounce deceived two players but easily collected by home winger James Ferguson who took the direct route to the line. Another conversion from Owenson put Musselburgh 14-0 in front. Before the restart Bonner limped off and later further reshuffling of the pack had to be made after tight head Salt left the field with a recurrence of his neck injury. As the second quarter progressed there was no sign of any Kirkcaldy resistance and two more quick fire converted scores from McGhie and flanker Graeme Bowman saw the score to progress to 28-0 in the 37th minute. Further indignity was heaped on the beleaguered Blues when they conceded a penalty try following a series of penalties in their own 5 metres zone. However the 35-0 reverse was slightly softened in added first half time when Connor Wood worked his way over the line. After a sixth Musselburgh score from centre Gregor Tait Kirkcaldy began to gain momentum for the first time and were rewarded with an Struan Robertson try. In the final half hour Musselburgh maintained their attacking style but a new found Kirkcaldy resistance and limited them to more scores in that time. Before the end additional Kirkcaldy tries scored by Wood and scrum half Scott Anderson earned that valuable bonus point. Musselburgh: M Cimprich, J Ferguson, R Young, R Watt, G Tait, D Owenson, K McGhie, C Owenson, R Gregor, C Arthur, G McKinstry, W Fleming, D Slaven, G Bowman, L Hutson. Replacements: C Slaven, N McNairn, J Anderson, C Pryde, R Smith. Kirkcaldy: F Smith, C Littlejohn, J Laird, A Black, O Bonner, G McKenzie, S Anderson, G Queen, J Pow, M Salt, C Wood, M Harper, R Bonner, D Turner, S Robertson. Replacements: C Hamilton, W Beattie, R Brown, F Bruce, I Gillies. Current standings: 11 Josh Laird; 10 Connor Wood; 8 Struan Robertson; 6 Rhys Bonner. Dayle Turner; 5 Jack Pow; 4 Finlay Smith; 3 Matthew Harvey, Greg Wallace; 2 Conar Littlejohn, Alex Black, Owen Bonner; 1 Michael Harper, Jack Denton, Craig Hamilton.